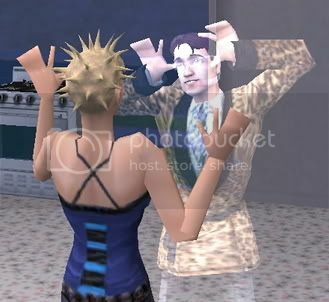 This week was fairly uneventful for the MRC sims, which is always blessed. 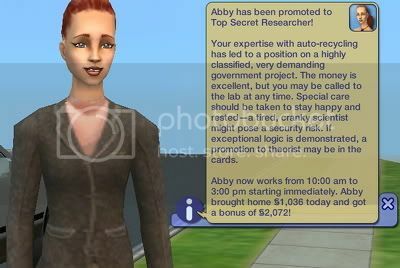 I'm contemplating having Abby quit her job once she earns 10,000 simoleans just so she can spend more time dedicated to earning her skill points. Now that she's so high on all of her skills, it takes forever for her to earn just one point. I think I'm going to work on getting up all the skill points to something like 7/10 at least, then let her quit and focus only on building skills. After all, with only five of them, the food costs are a bit less anyway, and the bills are less as well thanks to eliminating some of the light fixtures. 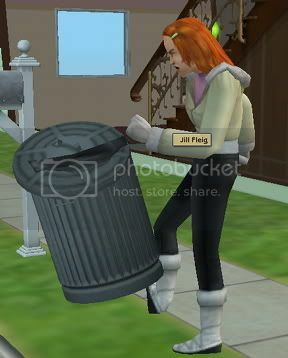 Day 33 started off with former friend Jill Fleig kicking over their trash. 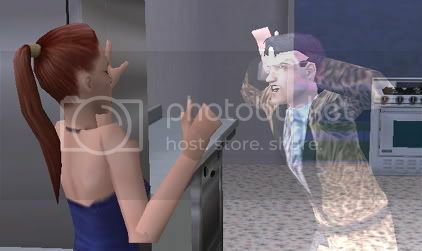 This is a crucial event, as you will come to understand in the next few posts, and the next time Abby sees Jill, I'm going to have her bitchslap the woman. Jared managed to nab another body skill point. His accomplishment might have been slightly outshone by Abby's fantastic promotion and bonus, though! The hours are great, and the money is right. Yay, Abby. That night, Romeo showed up for the first time ever! Ghostly Romeo, I thought you were going to be the one kind ghost out of the lot of them! And Abby once, while she was trying to cook dinner. Fortunately, daylight drove him off before he could do any more damage, though I'm starting to be concerned for poor Janie's heart. It seems she always gets scared twice a night when the ghosts are up and about.